First, we head to Sourceforge, which tracks trixbox CE downloads and see how trixbox CE stacks up against Digium's claimed 1.5 million downloads. * Partial data: End of month not yet reached. Taking a daily average, the final 2008 total downloads should be ~292,587. That's 292,587 (year-end estimate) vs. 1.5 million (so far) for Asterisk. So it would appear Digium's Asterisk beats Fonality trixbox CE by over 5X! Not so fast though. I was pretty sure the Digium download numbers were for Asterisk and AsteriskNOW combined. AsteriskNOW and trixbox CE are more comparable to each other, since both have FreePBX installed, both are .iso bootable CDs, they're both nearly plug-and-play distros, etc. So to be fair to Fonality's trixbox CE, I should compare AsteriskNOW to trixbox CE. I contacted Digium's Bill Miller, VP, Product Management, and asked him for the breakdown in their 1.5 million downloads. "The only caveat to any comparison I make between Asterisk/AsteriskNOW & trixbox CE is that you host your own downloads - not a 3rd party like Sourceforge. So there I have to have a healthy level of skepticism for any numbers Digium cites. Nevertheless, I think it'll be an interesting discussion if I post these comparative stats in an article." Bill explained, "19.8% are AsteriskNOW. We are close to par with them.". Indeed at 19.8% of 1.5 million equates to 297,000 downloads or roughly 6500 more than trixbox CE. Although, I said above I had to wear my skepticism hat, I think the numbers Bill gave me sound credible. Bill Miller ads, "Due to the other open source packages they have integrated, and the head start they had, we suspect that they have more in trixbox than AsteriskNOW in production but we are taking downloads and share from them." I would agree with Bill that there are indeed more trixbox CE boxes in production, but it does appear from these numbers that Digium's AsteriskNOW is closing fast in production numbers and already exceeding Fonality's trixbox CE in downloads. 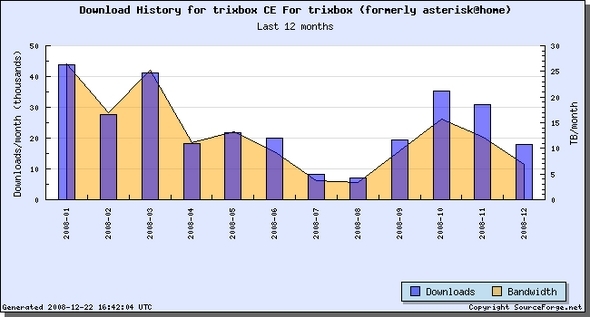 To be perfectly frank, I'm a little bit surprised AsteriskNOW has surpassed trixbox CE, since I'm sure even Digium would admit that trixbox CE, which was formerly Asterisk@Home, had a huge head start and developed a strong community (see trixbox forums and the sheer number of posts & threads). In fact, Bill Miller mentioned the head start in our conversation. Still, the number of downloads between the two is very close and they are neck-in-neck. Of course, if you add in regular Asterisk downloads it's no contest. Digium wins by a landslide. \"The only caveat to any comparison I make between Asterisk/AsteriskNOW & trixbox CE is that you host your own downloads - not a 3rd party like Sourceforge. So there I have to have a healthy level of skepticism for any numbers Digium cites. Nevertheless, I think it'll be an interesting discussion if I post these comparative stats in an article.\"
Bill explained, \"19.8% are AsteriskNOW. We are close to par with them.\". Indeed at 19.8% of 1.5 million equates to 297,000 downloads or roughly 6500 more than trixbox CE. Although, I said above I had to wear my skepticism hat, I think the numbers Bill gave me sound credible. Bill Miller ads, \"Due to the other open source packages they have integrated, and the head start they had, we suspect that they have more in trixbox than AsteriskNOW in production but we are taking downloads and share from them.\"